HOUSTON — The historic NASA jumbo jet that ferried retired space shuttles piggyback to their museum homes is now being prepared for its own lift to where it will be put on public display. Parked on a remote tarmac at Ellington Field here in Houston, NASA's original Shuttle Carrier Aircraft (SCA) can still be recognized as the specially-modified Boeing 747 it is, but seen from a distance its silhouette looks wrong. A closer inspection reveals why; the plane's tail (vertical stabilizer), ailerons, engine nacelles and landing gear have now been removed. And it is soon to shed even more of its parts. The Independence mockup arrived by barge from Florida in 2012 and then rode atop a wheeled transporter the 1 mile (1.6 kilometer) to the space center. NASA 905, which for 30 years ferried NASA space shuttles across the nation, was flown into Ellington Field that same year, where it has sat, waiting, ever since. To get to Space Center Houston, the 747 jet will need to travel nearly 8 miles (13 km) on two major thoroughfares, Texas State Highway 3 and NASA Parkway (also known as NASA Road 1). The SCA, like the other aircraft of its type (when intact), is 232 feet long (71 m), 63 feet tall (19 m, to the top of the tail) and has a 196-foot (60 m) wingspan — not exactly what you'd call "street legal." To be cleared for a landing — or rather to clear the roadways — the aircraft needed to be partially dismantled and then again reassembled when in place at its new home. Enter Boeing and its Aircraft-on-Ground (AOG) team. Boeing, as part of its $4.5 million donation to the "Shuttle and 747 Carrier Project," has dispatched its AOG team to Ellington Field. Frequently deployed around the world to get airplanes back in the air and in service, the AOG team at Ellington are working to transfer a large piece of NASA history to a place where the public can tour through it on display. In the process, the team is making a bit of its own history. Before NASA 905 can move to Space Center Houston — a move that is currently targeted for late April or early May pending clearance from the city — the SCA also needs to lose its wings. According to project officials, it will be the first time that the AOG team has removed the wings from a Boeing 747 in the open, without it being inside a hangar. Once that crane-assisted maneuver is done, and NASA 905's aft fuselage is separated at two seam lines from the rest of the body, the aircraft will be ready to roll. While its smaller parts will be loaded onto conventional trucks for the move, the 35-foot-tall (11 m) and 25-foot-wide (8 m) fuselage will be placed onto a motorized transport for its two-night journey to the space center. Much like the earlier moves of the real shuttle Endeavour through Los Angeles and the transfer of the Independence from the dock to the visitor center, the move of NASA 905 is expected to be a spectacle on full public display. Only moving the SCA at night, Space Center Houston plans to have viewing locations along the way, the details of which to be made public as the date nears. Meanwhile, work has begun to prepare the SCA's parking spot and display companion. In mid-February, workers at Space Center Houston poured 340 yards (311 m) of concrete to form the foundation for NASA 905's new outdoor exhibit. Nearby, in the adjacent parking lot, the space shuttle Independence is undergoing a restoration to its exterior prior to having its walkthrough crew cabin and payload bay upgraded to reflect the look of the real orbiters at their retirement. When completed, visitors to the 747 Space Shuttle Carrier Aircraft display will be able to tour inside both NASA 905 and Independence. Space Center Houston plans to outfit the SCA's interior to be an interactive museum devoted to the history of the plane, as well as NASA's 30-year shuttle program. 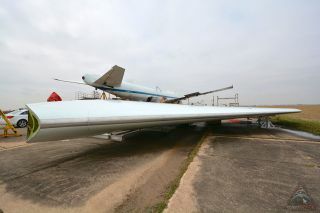 Click through to collectSPACE.com to see more photos of NASA’s Shuttle Carrier Aircraft being dismantled for its move to Space Center Houston.